Team up with friends as you work through this action RPG in a post apocalyptic universe. Players can trade weapons, use tactics, and level up their characters. Each player's class as specific abilities that can be used to support other players. Borderlands creates a universe of gameplay that goes far beyond anything anyone would expect. Designed with a groundbreaking content-generation system, the game creates thousands of unique, randomly generated missions, weapons and situations. An extraordinary cooperative experience, Borderlands allows for multiple players to share the same game experience simultaneously online. Players can freely join or leave the game at anytime -- or choose to play in the full single-player mode. Borderlands features life-like character animations, impressive real-time physics, and customizable vehicles. 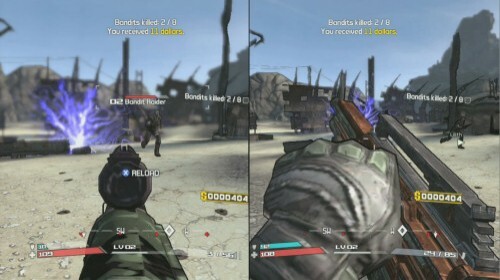 This page contains co-op info for Borderlands on the Xbox 360. All information about Borderlands was correct at the time of posting. Information is subject to change. If you see any errors please email us. Page created in 0.4230 seconds.